Ever seen the movie "What About Bob?" with Bill Murray? Well, I did see it, but don't remember much about it now. What's really funny is that my husband, Mark LOVES that movie and the title of my blog post today is what he posted on his Facebook account the day we sailed for Alaska. I guess that line is a famous Bill Murray quote from the movie. Mark had to explain it to me. Sad, I know, but funny now, huh? So yes, we went sailing - off to Alaska and a wonderful journey! The timing of this trip couldn't have been better for us, and I love that God knew that last year when He allowed me to earn the trip from Stampin' Up! on the last day of June! What a blessing for us now and just the respite we needed from dealing with my Dad's death and all the 'stuff' that goes with that. I am so grateful as we had a truly marvelous time together. We saw and experienced several once in a lifetime moments and had so much fun just being with each other. I loved every minute! We do have lots and lots of photos, so I'll be sharing some here in the next few days. Mark has discovered the movie maker thingy on the computer so he has been playing around with them and I've been afraid to touch anything because you know, I don't want to mess it up! But - photos are forthcoming! For now, how about a card? It's been a while, yes? One of my favorite stamp sets in the new Mini Catalog is called The Open Sea. It has really beautiful images in it and is perfect for lots of card styles. 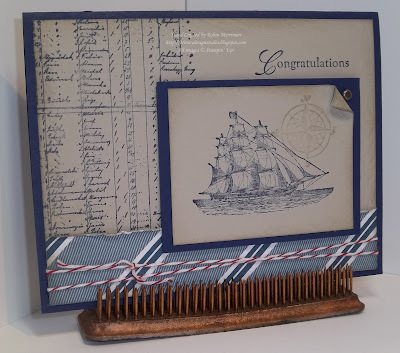 This card was one I designed for my May stampers. It's meant to be a Graduation card, but I made several others as Thank You's, and it would be a great Father's Day card! My greeting here was taken from the Wedding Sweet stamp set - once again versatility is key! 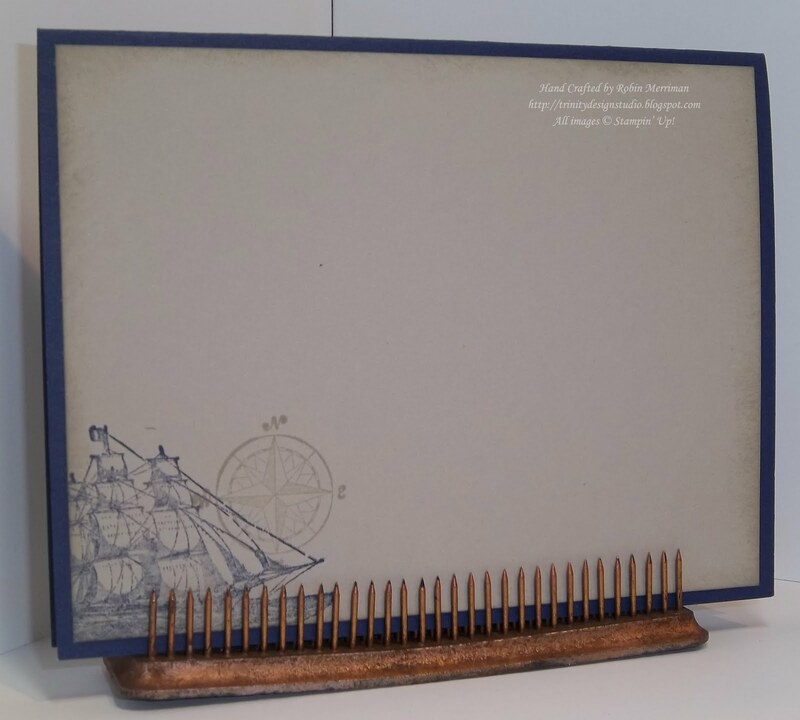 We used Night of Navy and Sahara Sand cardstock and inks and the Designer Paper at the bottom is from the Nautical Expedition pack in the Mini. I just roughed up the top edge with my Bone Folder. Nothing fancy, just a little more personality for the card! Don't you love the Baker's Twine wrapped around the bottom? It added just the right touch of red and I really liked the nautical feel of it here. Just a little stamping in the corner with lots of room to write a message. Thanks for hanging in there with me! I did get some concerned e-mails from a few of you wondering if I'd fallen off the face of the earth. But I'm still here and I have lots of creativity in store for you! So come back and visit ok? It makes my heart happy when you do! Your trip sounds awesome--so glad you had the opportunity to go. And I'm glad you're back! I've missed your beautiful creations....like this one. I love your card! I love that movie, isn't he like tied to the post or something on the boat cause he was so scared?